this is NOT the deer i was pursuing last year, after reviewing the photos there are slight differences between the buck i was after and this buck. the above stated comment is correct and I did have an issue last year in which my hunt was ruined, i have spoken to who i thought the individuals were and they denied having any part in this, and i have no evidence to prove otherwise. i am hopeful that this issue won't happen again because i value finding a spot in which i will not see anyone as much as i value a trophy animal. 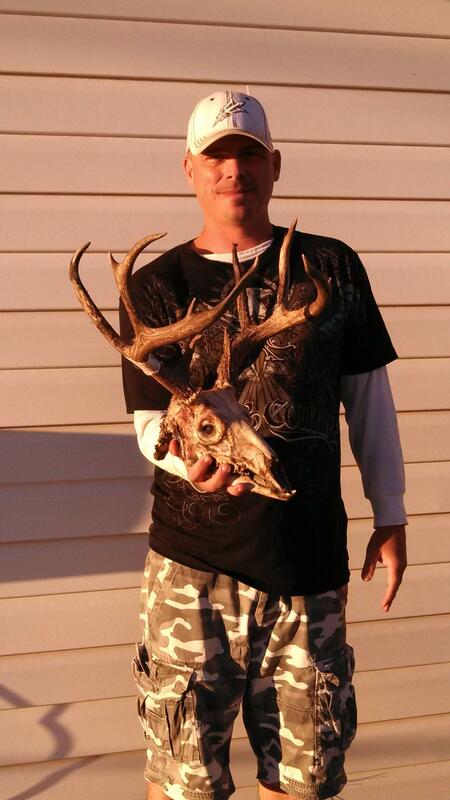 congrats to the hunter who killed this buck. I'm posting this for a friend of mine. He has 3 female, and 2 male Redtick/ Walker cross pups for sale. they are 7 months old and have been worked with on trailing scents. the mother is a Walker and has been on 20+ lions, the father is a Redtick and has been on lions as well but I'm not quite sure how many. He runs his dogs strictly on mountain lion. He's selling these pups because at the moment he has more dogs than he would like. His asking price is $100, I will include pics later today. Thank you Scott, stop by anytime. yes the other buck was huge and had everything going for him....very massive...awesome tine length...very wide spread! he still haunts me almost every night...but if everything lines up again he will be #1 on the hit list this year! Thanks everyone. Sorry for the late story but here it goes. I was very discouraged headed into this hunt as i had not seen a buck that would score over 100" during all of my scouting trips, so needless to say i went to a spot where i had seen the highest numbers of bucks. During day 1 of the hunt i was able to locate an absolute giant at around 08:00 he was across a large canyon and i knew it was going to be very tough to get a shot at him, so i started slowly making my way down into the canyon to trim the distance and see if i would be able to get a shot off on him, as i am making my way down the shrub oaks got thicker and thicker and i realized there was no way i was going to be able to find him much less get a shot off at him so i start making my way back to the ridgeline from which i spotted him. i was able to find him again and contemplated about taking a shot from this distance, decided to shoot and missed right under him by about 2' the flag immediately came up and disappeared down into the next canyon. i was disappointed that i missed the shot but satisfied in the fact that i did try to close the distance but the thick foliage did not allow me to. went back to camp somewhat disappointed but i had hope of finding him again in the morning! Day two started off by finding a group of bucks nearby but no shooters, so i continue down the ridgeline and spot another group of bucks....same thing no shooters. i am slowly making my way down to the spot in which i found the big one the day before when i found another group of bucks about 200 yards away, at first there were 3 bucks feeding in an opening one nice buck i'm guessing real close to 110". I stayed in my binoculars watching to make sure i had seen every buck in the group, after a few minutes a bigger buck walks out...nice buck but not what i wanted, about 5 minutes later out walks this buck! now i had a decision to make, take this buck or try to find the big guy from the day before....i decided to try to find the buck from the day before. I slowly creeped over the crest of the ridgeline onto the opposite side of these bucks as to not spook them in case i was unable to locate the bigger buck i would still have a chance at the bigger buck of this group. i make it to the spot where i had glassed up the big guy get set up and start glassing and after about 20 minutes of not being able to find him i hear a rock roll over, i look and it is the same bucks i was just watching making their way to the North slopes and into the shade 90 yards away! as i'm watching and admiring the bigger buck of the group i decided to shoot....thinking i will probably never get a 90 yard shot at a buck of this size ever again! the shot hits him and he goes down! all of the years of passing on bucks has finally paid off and i had finally got a big buck that i was looking forward to. i hurried and cleaned this deer up because i knew if i was quick i could pack up camp....load up the horses and make it back to the truck and home but had my work cut out because i was by myself wich explains the reason why there were no field photos. i had the deer scored by Mr. Ralph Stayner of Nurtioso......124 1/8" gross.....117 1/8" net.